Okay, so this is the latest I've been on a month birthday post, but, as I mentioned before, we've been very busy. But, here she is...our 9-month-old baby girl. Saying 'Mama' and 'Dada' all the time. She also says 'Daddy', but she doesn't seem to know what that really means. Sorry, Daddy, maybe next month. She also very clearly copied me a couple of times when I said, 'out' - very cute. Drinking from a sippy cup. Crying and burying her head in my armpit whenever a stranger looks at her too long. Trying to roll away during diaper changes, which makes things more than a little difficult. Thanks to Miss Denise for the super cute babyGap dress! So, we are still alive and well- just exceptionally busy. We have a couple of things going on that are majorly high-stress. One of the things has the potential to be very exciting, and I can't wait to share it with you all. Just not quite yet. I promise to be a better blogger once things are a little calmer, and I feel like a person instead of a zombie. I just couldn't resist snapping picture after picture of my happy little swimmer in her oh-so cute bathing suit. By the time we got to the last picture, she was way past nap time, and clearly not in the mood to humor us with a smile! I can tell Eleanor really enjoys the special time with her daddy. I love hearing them play and laugh from the other room. Those moments are priceless. Here are a couple of pictures I snapped when I intruded on their daddy-daughter time a couple of days ago. The mohawk one cracks me up because she looks like she's playing the air guitar. Hilarious! Yesterday was a huge day! First, Eleanor learned to clap. 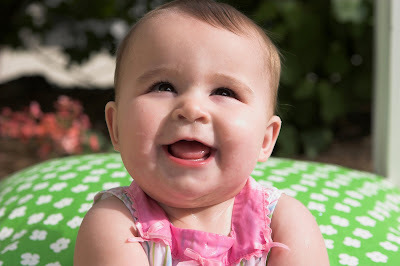 She saw another baby clapping at the mall, and then she did it. Now, there's no stopping her. I think it's the cutest thing ever, of course. She also pushed her shopping cart. I have to hold the shopping cart with her- otherwise, the shopping cart would move too fast, and the poor gal would fall right onto her little, baby noggin'. I found a new use for Eleanor's infant bath tub. Yesterday, I filled it up with water, and put some water toys in it. 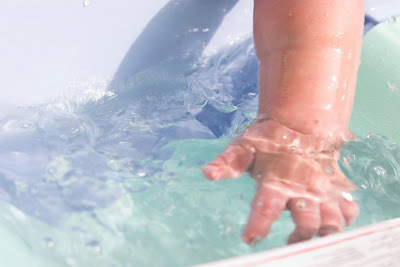 We took it outside, and Voila!...our very own water-play fun center. 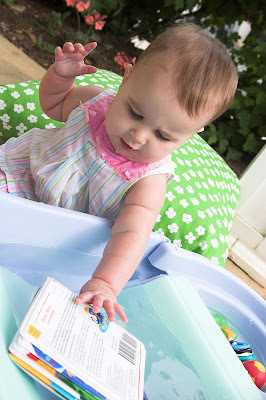 Eleanor had so much fun splashing around in the water, and fishing for her toys. She carefully took them all out, and then put them all back in...about a hundred times! 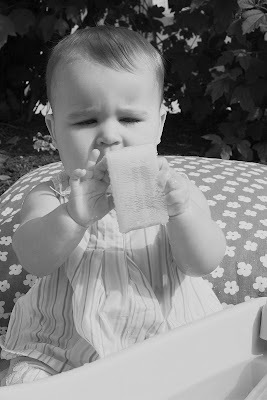 I put a sponge in, which she had never played with before. 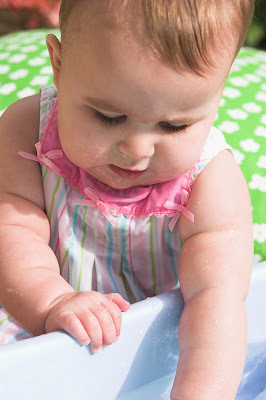 She very quickly discovered that if she squeezed it, water would come gushing out all over her- much to her delight! 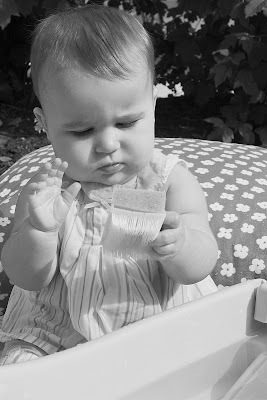 The black and white pictures are of her discovering the sponge. The pictures with the big smiles are, of course, when Daddy came home from work. 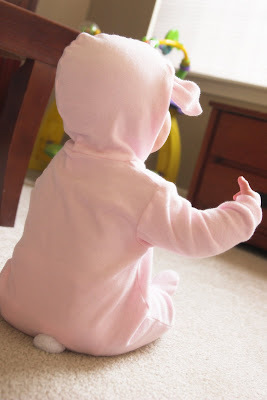 And the bunnysuit is what I made her wear to warm-up when we got back inside. Hey...I have to get my laughs too! "But how does Big Bird's tricycle go?" "Mommy, WHAT?? Can't you see I'm reading?" So, yet another trait she gets from her daddy...she loves her books. I, on the other hand, never read for pleasure because I have the attention span of a gnat. The last piece of literature I read was this month's issue of Parents magazine. Seriously, Jared (and his mom and brother- you guys know it's true) thinks that an outing to a bookstore is entertainment. I don't know how many hours I've spent standing around pretending I'm really interested in looking at books, so as not to give myself away to the hordes of book-lovers in the store. I don't even want to think about what would happen to a non-reader, such as myself, who dared tread on the sacred ground at Barnes & Noble. I just don't get it...why do we have to go to the bookstore every time we go to the mall? One week isn't enough to time to write a new book- the books will be the same! Recently, I have discovered that I can disguise myself much more easily at the magazine rack. That's where you can find the people who want to look smart by being at the bookstore, but don't actually care about perusing the shelves for hours. I can entertain myself for a good 15-20 minutes with a People magazine. I sometimes resort to going to Starbucks (even though I hate coffee) to kill a little more time. One extended trip to the bathroom, a couple of times up and down in the elevator, and there you have it, another fun day at the book store. I should probably let Jared take Eleanor to the book store. He sets a much better example. So, here are the photos from my latest attempt to capture the new teeth...I can't put these in the baby book, now can I?! In the last one, I think she was rubbing her eyes, so I would put her to bed, and stop putting my finger in her mouth. Hmmm...how will grandmas see the teeth?? Eleanor has always loved to be in a standing position. And nowadays, she's getting pretty good at it. She doesn't pull herself up to standing, but if you place her next to something she can hold onto, she'll stand there forever. Also, she has learned that falling down onto her little bottom isn't going to kill her, and has stopped turning on the waterworks with every minor fall. She's getting very brave! The other day, she took one step while holding onto the couch to grab the remote control. Here are some pictures of her showing off her skills. She even did a fancy one-handed move as a special treat. As you can see in the second picture, she is quite proud of her new big-girl moves! I really think Eleanor is being quite the little trooper. As long as I keep her distracted with fun things (books, toys, Jordan, etc. ), she isn't terribly fussy. She has slept so well the past two nights. I didn't hear a peep out of her either night. The only downside to this teething thing the past couple of days is that she's been incredibly clingy. (Which I'm not totally convinced is a downside at all!) She wants a ton of hugs, and to sit in my lap all the time. If I sit down with her on the floor to play, she reaches her little arms over and tries to pull herself into my lap. How could I possibly resist such sweetness? I even have to take her to the bathroom with me to avoid a meltdown. That's pretty much it for us, and since I have no picture of Eleanor to post today, I'm posting these pictures I took of my Mother's Day flowers. Man, God is good!! So, Eleanor is officially teething. No, really, this time. (Incase you missed it, here's why I have to include the 'really.') She woke up Sunday morning with a special Mother's Day surprise for her mommy...split gums with a tiny bit of white poking through. My beautiful Mother's Day flowers...Thank you, Daddy and Eleanor. She rocks, her name is Wendy. And a present she did send me. That I could not buy in the store. By your gift, we're truly blessed! Seriously, thank you so much, Wendy! These beautiful clothes are such a blessing! The boxes arrived around noon. I was so excited all morning because Wendy gave me the heads-up that they were coming today. I'm pretty sure the UPS man hates me because I run to the door to meet him whenever I see his big, brown truck outside my window. I say things like, "I've been expecting you," with a huge smile on my face, and he just stares at me. It's okay...I love him anyway. He brings packages of fun to my door. Here are SOME of the clothes! I couldn't fit them all in the pictures! Let's play a game...how many pairs of super sassy shoes can you find? Here are some pictures of Eleanor modeling the clothes. I couldn't get many good pictures because she was so busy digging through the clothes. (She really was). In particular, she loved the precious Halloween ghost overalls, and I must say they (and their turkey counterpart) were one of my favorites too! 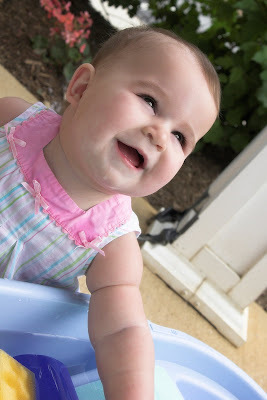 This last one is not part of the soft focus experiment, but I love it because she was crackin' up at her silly daddy. Also, I think I should add that this outfit is courtesy of Aunt Jennifer, and the headband is courtesy of Ashley. Thanks, girls! Happy Mother's Day to me! For Mother's Day, I got this sweet, new jogging stroller. Eleanor and I have been taking a walk every morning. Parts of our route are a little bumpy, and I wasn't sure the ol' Graco Snap 'n' Go was up to the challenge. So, I mentioned to my hubbie that I was considering getting a jogging stroller. Well, in true Jared fashion, three days later this arrived at our door. It is so nice! It's like the Cadillac of strollers, which is a serious upgrade from the old stroller. I would consider the old stroller to be about a Corolla (you know, it gets the job done, but isn't luxurious by any means). Eleanor loves riding in the new stroller, and agreed to help me show it off. Okay, there's really only one picture of the stroller, but my lovely assistant is just so cute! Today, Eleanor and I got together with our friends Laura and her 18-month-old cutie Jordan. We get together with them a lot- I just happened to have my camera handy today. The girls have this adorable ritual that they do whenever they see each other. First, Jordan squeals and runs up to Eleanor. Then she kisses Eleanor on the mouth and hugs her really, really tight. (Laura and I discussed today when we should put a stop to the very slobbery, very, very personal mouth-kissing, but for now it's cute.) Jordan then turns her cheek toward Eleanor, so that Eleanor can plant a big, fat, slobbery kiss on her face. They do this at least three or four times every time we're together, but never when we ask them to (for picture-taking). Here are some pictures of the girls playing at our house today. I tried to get a picture of their lovefest, but only managed the one that looks like Jordan's telling Eleanor a secret. I think she was saying, "Quick, kiss me as soon as your mommy puts the camera down!" In the third one, you can see Jordan sharing a toy with Eleanor. What a sweetie! 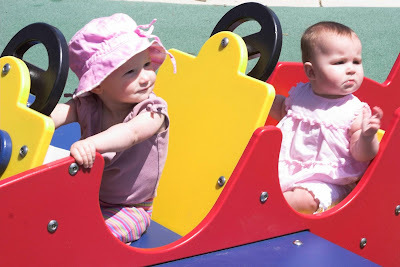 And here's a picture of the girls when we went to the park. You can see it was a little sunny for picture-taking. Eleanor looks really mad. I think she wanted to ride up front. We went to a new park today that was absolutely amazing! It made me wish I was a kid, so I could play on all the cool stuff! I've never seen so much equipment in one park. It's absolutely huge! They designed it so that kids with and without physical disabilities could all play together. They had about five different kinds of swings to meet any special need. Here is the website, but it looks like they haven't updated it since the park was built. I can't wait to go there again!